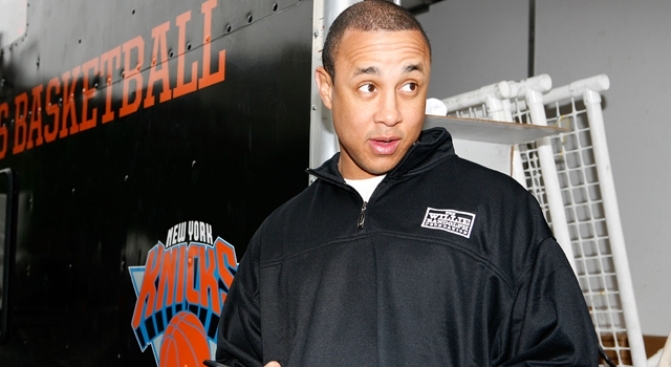 Former Knicks starJohn Starks missed his shot at Brooklyn kickball glory. The popular Williamsburg-based Brooklyn Kickball league opened its season Sunday in a very soggy McCarren Park, despite the absence of the former Knicks star John Starks. Just about any other Sunday this summer, that small fact wouldn't raise any of the beautiful eyebrows in the so-called hipster kickball league. But today, Starks was supposed to come out in the rain and throw the first pitch - a result of an earlier fundraiser organized by league overlord Kevin Dailey. But whether it was the weather, or his realization that the league was just a handful of young adults battling it out in a wet field...something kept him away. He's expected to come back in two weeks and throw what looks might end up being the 2,500th pitch.